The composer speaks II : proceedings of the Australian New Music Conference 1990 / edited by Graeme Skinner and Caitlin Rowley. This pdf e-book is a reissue of the book first published in 1998. The file size is 22MB. 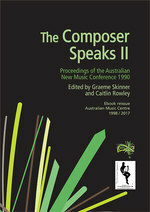 In the 1990s, the Australian Music Centre published three volumes of conference proceedings under the title The Composer Speaks. This e-book is a pdf edition of the second one of these, edited by Graeme Skinner and Caitlin Rowley and originally published in 1998. It includes a substantial part of the program of the Australian New Music Conference, organised by the Australian Music Centre (under its then trading name Sounds Australian) in Brisbane in August 1990. The Composer Speaks II is a particularly interesting document because of some contentious issues debated during the Brisbane conference. This was the time of the so-called 'style wars' in Australian new music - 'wars' sparked by an anonymous entity calling themselves 'the 'Adelaide Pastoral Company', whose widely circulated manifestos attacked new complexity in contemporary composition. Panelists and conference participants discussing new complexity and related issues in Brisbane included Gerard Brophy, Warren Burt, Stephen Cronin, Neil Currie, Grahame Dudley, Andrew Ford, Malcolm Fox, John Gilfedder, Mark Pollard, Greg Schiemer, Ian Shanahan, Stephen Whittington, David Worrall, and others. Another valuable transcript in The Composer Speaks II is the panel discussion, chaired by Richard Mills, in which Musica Nova festival's visiting composers David Del Tredici, Kurt Schwertsik, Sofia Gubaidulina and John Corigliano discuss the question of form at some length. 'For me, form is extremely emotional' states Del Tredici. 'Form is the most important thing in a composition... the only possible way to give unity to a variety of material, a variety of possibilities, says Sofia Gubaidulina. And John Corigliano continues: 'I've always felt there were two kinds of form, and we had to be aware of both. One was emotional, and one was structural...'. The e-book also contains a keynote address and a session about music education and music in the school curriculum; David Worrall's presentation about teaching composition; a letter by Vincent Plush reflecting on the success of promoting Australian music for performance overseas, particularly in the USA, during the Australian Bicentenary; and a session about electronic and computer music with presenters Warren Burt, Greg Schiemer, David Worrall, Gordon Monro, and others. A previous conference was organised two years earlier in Sydney under the heading 'Australian National Composers' Conference' - the proceedings, published as the first The Composer Speaks book, were made available as an e-book in 2015 and can be found here. The whole series of three The Composer Speaks books, long out of print, is an important document of the development of thinking around some central issues to Australian composition. The Composer Speaks III e-book will be made available at a later date. The Composer Speaks II e-book is a pdf facsimile edition, and the pagination has been kept intact which results in some blank pages between chapters. Contents table has been equipped with hyperlinks to each chapter. 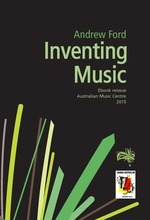 eBook: Inventing music / Andrew Ford. 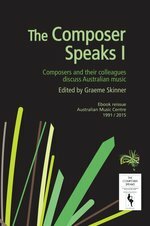 eBook: The composer speaks : composers and their colleagues discuss Australian music / edited by Graeme Skinner.